Tornado Rider performs while fans experience their live festival show. The Newport Jazz Festival, held in 1954, brought music festivals to the Americas. 1967 marked the year rock music showcased its genre at The Monterey International Pop Festival. In 1969, the most famous music festival in America, Woodstock, premiered and changed the course of music history. Over 500,000 people showed up to Woodstock from around the nation, breaking the original plan of a 50,000 people festival, and featured great artists in history, including The Grateful Dead, Canned Heat, The Who, Jimi Hendrix, and Janis Joplin. In the 1990s, Lilith Fair revived the art of the music festival, and over the past decade, more festivals have erupted, spearheaded by millenials and a love of live music. Today, an annual sea of festivals like Coachella, Bonnaroo, and Lollapalooza, all sell out within the first month of tickets available. Festivals have beckoned forth a completely new way of listening to and experiencing music. Fans can now explore new and upcoming artists and experience the best performances, often outdoors surrounded by fellow genre appreciators. A new collaborative economy also heightens the millennial attendance, for most millennials value experiences more than objects. This new generation possesses less materialistic ideals and deeply care about friends, music, alcohol, unique experiences, and a break from their hectic high school/college lives. “Young millennials want to have a good time with their friends and get pictures together on social media. Everyone is super happy and nice,” annual Music Midtown festival attendee Ashley Skaggs said. Social media also have contributed to the heightened awareness of music festivals, with every fan feeding their social media with pictures, videos, and “festival fashion.” Every one of these tweets or posts gives publicity to the festivals and the artists present, making the next year’s audience that much greater in anticipation. For example, fans posted more than 3.5 million tweets in the first weekend of Coachella 2015, while an estimated 23% of fans posted about a live stream of the festival. Music Midtown, founded in 1994, acts as the main festival for music lovers in Georgia, and has featured artists such as Bruno Mars, Blink-182, Weezer, Bastille, and Oh Wonder. Every year, Music Midtown hosts 30 popular artists across four stages, ranging in different genres. “Every year there is different food, and I’ve never seen the same type of people, because every year there is a different genre of music they [Music Midtown] are going towards, like one year is all rock bands and you see a certain crowd, the year after it was all electronic stuff, and then last year it was all underground artists,” Skaggs said. Skaggs explains how the type of music can influence the type of audience that attends. All across Georgia a variety of different music festivals exist, each representing a different genre of music such as Jazz, Hip-Hop, Christian, Bluegrass, and Alternative. A decade ago, this kind of diversity in the music industry would not exist in one specific place with so many attendees. Today, music lovers can drive two hours and embark on a brand new experience–from Christian rockers to Hip Hop legends. “ I feel like if you are at some edgy metal festival, it is going to be different kind of crowd, different kind of people, different kind of area, and I feel like at Music Midtown it was a more general and uplifting festival,” sophomore Maggie Glancy said. A music festival introduces a new wave of light within a person, the music flows through them, capturing an indescribable feeling. “I lose myself everytime I go to a festival, lose track of time, probably why it goes so fast, I lose track my body, my thoughts. It is almost like the music is controlling me and everyone around me. It truly is an amazing experience,” artist and music lover Olivia Towe said. The free-spirit and good time millennials enjoy at these one to three day festivals entice them to attend more and to travel to them, as well as share them with their friends. 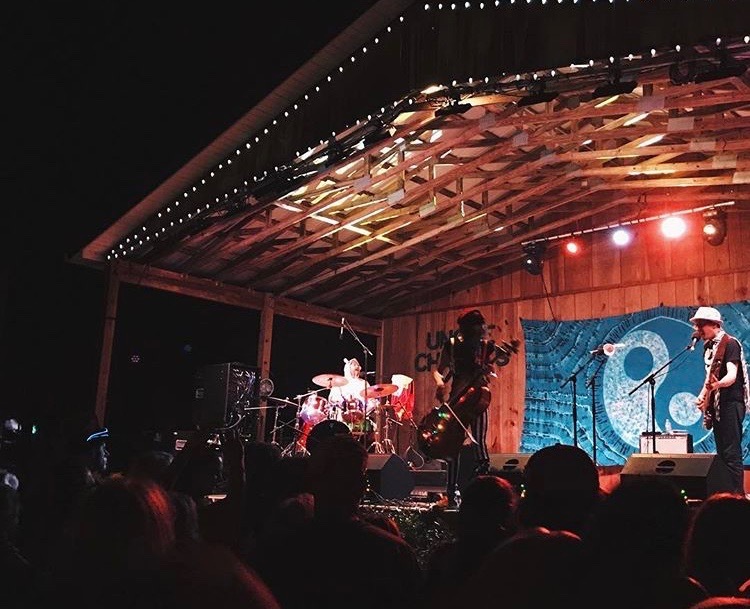 The live music, the vendors, and whether it includes a full blown concert or a jam session with artists having a great time, brings an irreplaceable energy. “The festival scene is a community, a collection of minds, bodies and souls, wavering energies connected by one common ground. It’s a family. It’s a place of liberation and another piece of personal freedom,” Towe said. Music festivals also breed up and coming artists. The Grateful Dead, for example, started at a music festival, playing their hearts out, becoming a world-wide symbol for the hippy culture. The Dead, now obtain an extremely large fan-base, who call themselves “deadheads.” Newer, less-known, bands gain experience, money, and discovery, growing a new supportive fan-base that they could not receive anywhere else. “The Grateful Dead is all about love and light. As a musician friend says in one of his songs “It’s all about the music and it always sets you free” and to quote the Grateful Dead, “ once in a while you get shown the light in the strangest of places if you look at it right.”,” “deadhead” and math teacher Melodye LeCroy said. The economy for the music festival business proves higher than ever and experts expect it to grow more in the next couple of years . The american hip-hop duo Outkast made $60 million playing in 40 festivals in 2014. The money, the devotion, the outdoor venue, and the connections artists make with other cities and artists brings them to festivals, and they enjoy it just as much as every single fan in the audience. 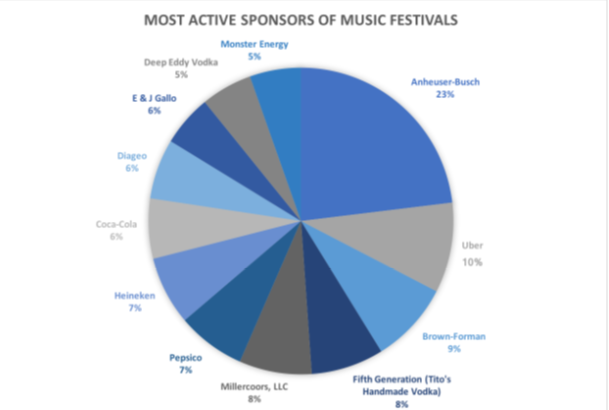 Most large companies pay millions to sponsor a large music festival. The beer manufacturer Anheuser-Busch gained the title of the biggest sponsor in 2017, partnering with 51% of U.S music festivals. Uber, Brown-Forman, Fifth Generation Vodka, and Millercoors follow Anheuser-Busch in their sponsorship journey. Attendees benefit from an incredible deal when they buy tickets and come to festivals, gaining access to over ten concerts and multiple event stages. Most fans buy a 3-day pass to a variety of artists for a range of $185-$450, so they could only come to one festival, seeing all of their favorite bands, rather than seeing one artist for half of that. “You get to be yourself, but still have fun, it is totally worth the money,” Skaggs said. Overall, music festivals bring so much passion and excitement to every single person that comes, whether that means the fans or the bands. With the industry rising and taking control of music nationally, album sales decreasing and live music gaining in hype and style within the new generation, music festival attendance and economy will continue to rise.